Learn to create a powerful online presence that captures your audience by exposing them to the sights and sounds of your band or music project and allowing them to easily become paying fans. 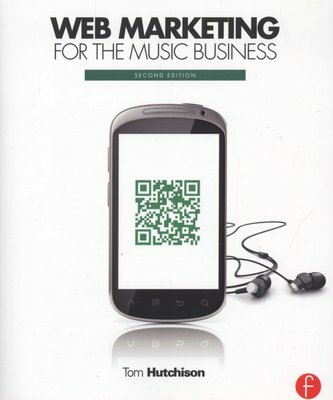 Web Marketing for the Music Business second edition includes updated basics and advice on website creation: * Setting up your website and website design * Selecting your domain name and host * Using HTML, Java, widgets, Flash, and RSS to charge up your website New! * Using search engine optimization (SEO) methods for the best search engine rankings New! * Maximizing social media sites like Facebook, YouTube, and Twitter for easy sharing by fans * Monitoring site traffic and using analytic tools * Adding audio and video to your site * Choosing and using commercial download services * Creating and managing an online store * Finding your market online * Creating a mobile website and mobile media campaign Market your band using sites like Facebook, SonicBids, and ReverbNation, where fan interaction is key, and fan-generated content can be encouraged. Learn techniques to coordinate your offline and online promotions for maximum impact. 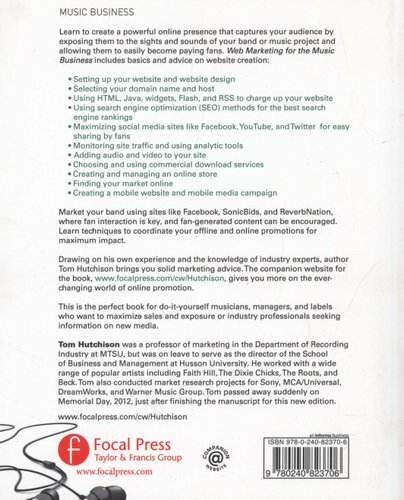 Drawing on his own experience and the knowledge of industry experts, author Tom Hutchison brings you solid marketing advice. 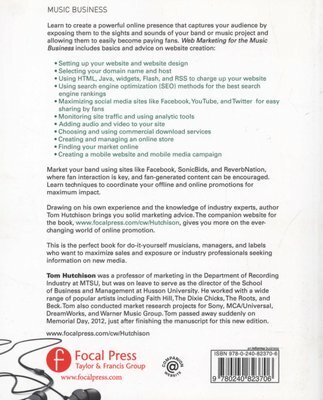 The companion website for the book, www.focalpress.com/cw/hutchison, gives you more on the ever-changing world of online promotion. This is the perfect book for do-it-yourself musicians, managers, and labels who want to maximize sales and exposure or industry professionals seeking information on new media.